Join the ISU Monarch Workgroup as an intern! 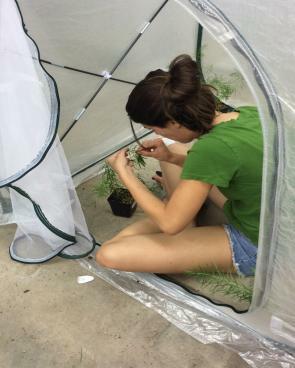 Lab and field technician roles for both monarch and milkweed research are available. All levels of experience are encouraged to apply and applications will be reviewed until all roles are filled. A part-time position is available immediately and we are also hiring to fill multiple full-time positions for Summer 2017 - details below! Looking for a fast-paced, interdiscplinary internship? In this role, you will assist members of the Iowa State University monarch workgroup with field and lab research, data management, and/or outreach activities. Field research will incorporate milkweed demonstration plots and edge-of-field conservation practices to examine the ecological responses of butterflies, bees and plants. Identification of prairie plants and weeds is important to our work. Lab research may include care of milkweed species and/or nectar plants, monarch rearing or assisting with oviposition lab trials. Other duties: data collection, data entry, database management and maintenance of field equipment. Outreach includes public events such as field days, discussing monarch and milkweed biology, and highlighting conservation efforts for rural and urban audiences. Positions are full-time (30-40 hrs/week) May to August, 2017. Compensation is $10/hr or according to experience. You must be enthusiastic and prepared for field research that includes extreme weather conditions (heat, humidity, etc. ), biting insects, rough terrain and other adverse conditions. You must have a valid U.S. driver's license and means of transportation - travel to statewide research sites is expected. Preference will be given to applicants with coursework in entomology, biology, biological systems engineering, botany, ecology, environmental science, wildlife, natural resources, forestry, horticulture, plant pathology, agronomy or related fields. To apply, email PDF resume, cover letter, class schedule + contact info for 3 references to Jacque Pohl, coordinator, jpohl@iastate.edu.